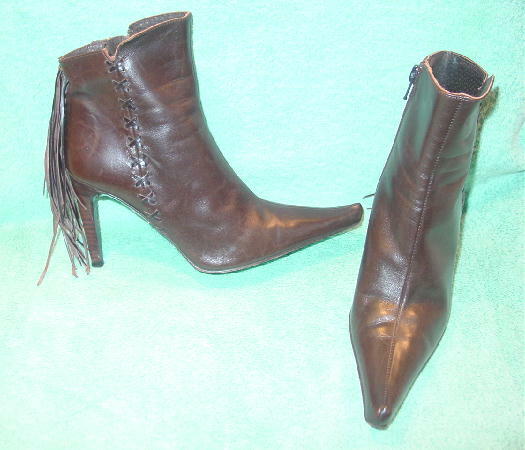 These dark brown leather vintage ankle boots were made in Spain by Charles David. They have brown leather linings and insoles and 6 3/4" long inner zippers. 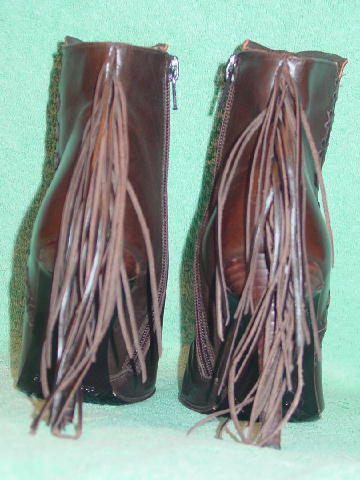 The back vertical seam has 29 thin leather very dark fringes (approximately 5" long). There are elongated pointed toes and brown stacked high heels. The top boot front is 5/8" higher than the back. The outer sides have an X shaped very dark lacing accent. The boots have some scuff marks and wrinkles. They're from a stylist's inventory, and were worn in a foreign film. top front of boot to bottom of heel 8 1/8"
top back of boot to bottom of heel 7 1/2"